This is an vegetarian dish which uses chickpeas and a lot of spices to make very filling dinner. Serve with rice, naan bread and enjoy. 1. In a large skillet, heat the butter. Add onions and cook for about 15 minutes on medium low heat, or until golden brown. 2. Add garlic, ginger and Jalapeno to onions and stir well. Cook for about two minutes. 4. Add the coriander, cumin, cayenne, turmeric, salt and stir well. Then add the diced tomatoes, chickpeas and garam masala. 5. Cook for about five minutes or until the chickpeas and have heated through. Add some water if a thinner sauce is desired. Add salt for taste, as needed. If desired, top with a squeeze of lemon, a spoon of plain yogurt or cilantro. This look delicious! We re Indian food fans– but I’ve only tried to make it a few times. 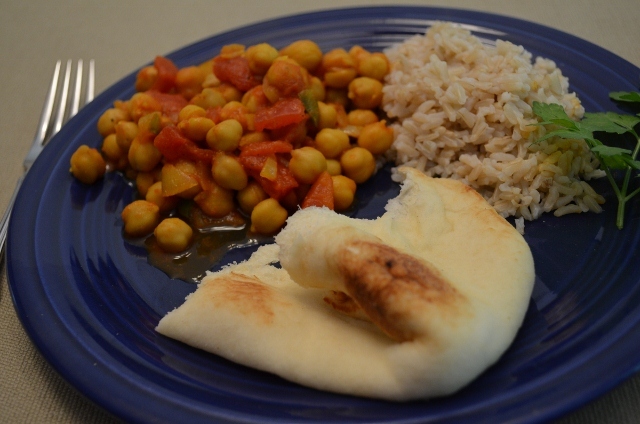 Do you make your own naan, or have a good place to buy it? I buy the naan at the grocery store. Have not tried making it yet. It really goes well with the spicy food. This looks and sounds yummy!! !